Stage 3 mesothelioma is an advanced stage of the disease, since the cancer has spread beyond its origin. Treatment options are more limited, and patients face a prognosis of about 16 months. More patients are diagnosed with stage 3 mesothelioma than any other stage. This stage often indicates spreading to other organs, including the lymph nodes. Symptoms for stage 3 are usually more severe and greatly impact quality of life. Curative therapy is still an option, though plans often focus on relieving symptoms. 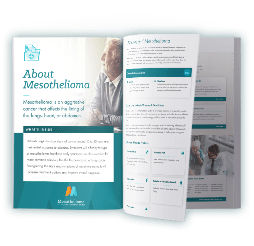 Due to the long latency period and late onset symptoms, the majority of mesothelioma patients are not properly diagnosed until the disease has advanced to stage 3. At this point, the cancer has metastasized or spread beyond where the tumors originated, but is still localized to one side of the body. Metastasis will vary based on the type of mesothelioma, but in most cases, mesothelioma cells will have reached the lymph nodes and spread throughout the abdominal cavity at this stage. Because of the more distant spreading, treatment options may be limited, with some patients only able to receive palliative care. With fewer treatment options, patients face a poor prognosis of just 16 months on average. With every type of mesothelioma, patients face fewer treatment options and worsening prognosis as the disease becomes more advanced. In recent years, more clinical trials have focused on finding effective treatments for even late-stage mesothelioma, with a few studies showing promising results for pleural and peritoneal mesothelioma patients. Pleural mesothelioma is the only form of the disease that has a staging system. Doctors can rely on several systems, though the TNM (Tumor-Node-Metastasis) system is the most used and frequently updated. The TNM system identifies the tumor size, if the cancer has spread to lymph nodes and where else in the body the cancer has spread. In the most recent edition, researchers decided to split stage 3 pleural mesothelioma into two categories based on their data around the tumor thickness and morphology and their impact on overall survival. The other staging systems, Brigham and Butchart, identify stage 3 similarly in terms of metastasis, but do not classify stage 3 into these subtypes. As a rarer form of mesothelioma cancer, peritoneal mesothelioma does not have a clear staging system. Doctors often rely on more general mesothelioma staging information, which describes this stage as localized to one side of the body, with the tumors spreading to nearby organs and lymph nodes. At this stage, researchers have found spreading to organs within the chest wall and abdominal cavity, including the appendix, kidneys and pancreas, as well as possible spreading to the lungs and thyroid. More recently, mesothelioma doctors have also used the Peritoneal Cancer Index (PCI) to help denote the size of the tumors present and where the tumors may have spread. PCI separates the abdomen into 13 distinct regions, which doctors can then give a lesion score of zero to three based on the size of the tumors found in imaging scans or through laparoscopy. Doctors will total the legion scores to help determine an approximate stage. Researchers proposed a score between 21 – 30 can indicate stage 3 peritoneal mesothelioma. Because pericardial mesothelioma, which affects the lining of the heart, is so rare, research is limited and this form also does not have a proper staging system. However, since pericardial mesothelioma is the most difficult type to diagnose, there is evidence that patients often aren’t diagnosed until the disease has advanced to stage 3 or stage 4, with the majority of patients diagnosed posthumously. With the limited data available, researchers describe stage 3 pericardial mesothelioma by the general cancer staging also used for peritoneal mesothelioma. The cancer at this point has likely spread to nearby lymph nodes, throughout the chest cavity and possibly to the lungs. Researchers note as the disease becomes more advanced, the tumors may have spread from the pericardium throughout the heart and pulmonary artery, which can also make it easier for the cancer to spread throughout the entire body. Compared to the earlier stages, patients diagnosed with stage 3 mesothelioma will experience more prominent and severe symptoms, which can greatly impact quality of life. As the cancer spreads further, they may also start suffering from new symptoms as it reaches other parts of the body. Palliative treatments may offer stage 3 mesothelioma patients relief from the worsening symptoms and improve quality of life. At any stage, mesothelioma patients face a rather dire prognosis. By stage 3, patients have a median life expectancy of about 16 months. In addition to stage, a number of factors can impact an individual’s prognosis, like the cell type and type of the mesothelioma, age, genetics and overall health. Together, these factors also influence the recommended treatment plan. Some patients have had success extending their life expectancy through treatment, and new clinical trials testing emerging therapies have offered hope to even advanced stage mesothelioma patients. By stage 3, patients’ treatment options can be severely limited depending on how much the cancer has already spread. In general, doctors may still rely on a multimodal approach of conventional cancer treatments, like chemotherapy and radiation therapy, to try to prevent further spreading and potentially shrink existing tumors. Emerging therapies, like immunotherapy, have also shown some success in extending survival for patients. For many, however, palliative care to reduce symptoms is the focus of treatment at this advanced stage. The majority of patients at this stage no longer have curative surgery as an option because the tumors are too far spread, though some may seek palliative surgery to help lessen symptoms. For instance, fluid buildup in the lungs (pleural effusion) or elsewhere in the body is a common symptom by this stage. Procedures like a pleurodesis or a paracentesis can alleviate the fluid pressure and improve quality of life for pleural and peritoneal mesothelioma patients. One of the most effective forms of chemotherapy for peritoneal mesothelioma patients is hyperthermic intraperitoneal chemotherapy (HIPEC), which has been able to extend life expectancy by 50% or more in some cases. But at this stage, most doctors believe the cancer is too advanced for the aggressive treatment to be effective. Instead, patients may receive traditional chemotherapy combinations, like pemetrexed and cisplatin, which can be applied curatively or palliatively. At more advanced stages, doctors are less likely to recommend radiation therapy. Radiation is considered a targeted, localized treatment. Since stage 3 mesothelioma indicates the cancer has spread throughout one side of the body, radiation would be ineffective. However, in some cases it may be recommended as a palliative treatment to shrink tumors and lessen symptoms. Some studies have noted radiation therapy can be effective in reducing symptoms like chest pain and breathing difficulty. In recent years, more clinical trials have focused on finding new, effective treatments for advanced stages of mesothelioma. One promising study focused on the combination of photodynamic therapy, a targeted treatment using light, with surgery for late-stage mesothelioma patients. This new treatment extended overall survival to 3 years, with an average of 1.2 years disease-free. The researchers also found a median survival of 7.3 years in a group of patients without lymph node metastasis, with nearly 2.3 years before disease progression. Clinical trials are also testing different combinations of standard treatments, like different chemotherapy drugs and surgery techniques. One clinical trial found radical pleurectomy followed by chemotherapy and radiation could extend life expectancy for stage 3 patients to 21 months on average, with 28% of the patients even surviving five or more years. Though surgeries like a pleurectomy often aren’t considered an option at advanced stages, researchers are still discovering new ways to apply these treatments, offering hope to patients diagnosed at later stages. 2 Bölükbas S, Eberlein M, et al. Factors predicting poor survival after lung-sparing radical pleurectomy of IMIG stage III malignant pleural mesothelioma. European Journal of Cardiothoracic Surgery. July 2013; 44(1):119-23. doi: 10.1093/ejcts/ezs648. 4 National Cancer Institute. Cancer Staging. March 9, 2015. Page last modified on August 2, 2018.